It’s the week before Memorial Day and things are going a bit crazy here at Natureworks. Last week was NOT easy for any of us. Luckily, the tornados missed us by a few miles, but they did so much damage to so many of our customers and neighbors I am still trying to wrap my head around it. We were without power for a couple of days. Saturday was a monsoon all day but my staff and I powered through and sold an incredible number of plants to some very hardy souls. Can we just start veggie week all over again? Okay, let’s do that. Dwarf tomatoes are all the rage- 3-4′ determinate plants with that amazing heirloom flavor. fast- so fast that I have mine in my car, even though I won’t have time to start planting my own tomatoes until the weekend. We are restocking our organic veggies this week, and some varieties (such as the super-hot peppers) are finally arriving. 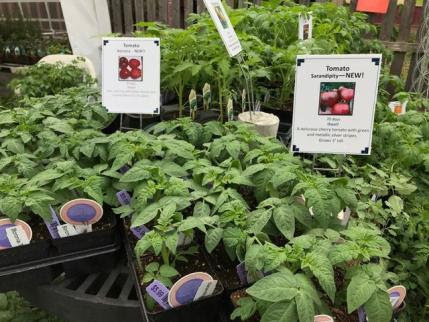 We have dwarf tomatoes, heirlooms, and sought after types such as ‘Megabite’ and ‘Juliet’. 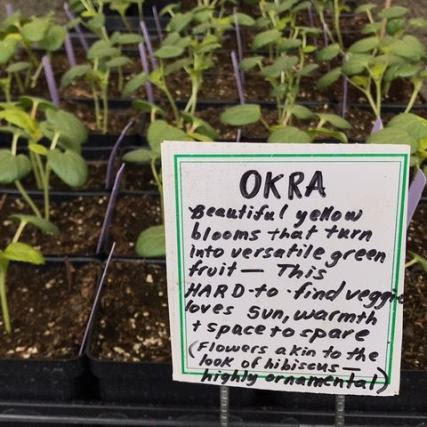 We have peppers and eggplants and tomatillos (the biggest and best crop ever), as well as unusual veggies such as okra. We have herbs galore and a fully stocked seed rack with warm season crops such as cucumbers, squashes, pumpkins, and melons. We ARE closed on Memorial Day (boy, does my staff deserve a holiday this year) so get your shopping done by Sunday at 5. Don’t forget, we are open Thursdayevening until 7 pm, it’s a great time to shop and beat the weekend rush. Pretty new wire hanging baskets custom designed and planted by my talented staff. Edibles are certainly not the only plants overflowing our benches right now. 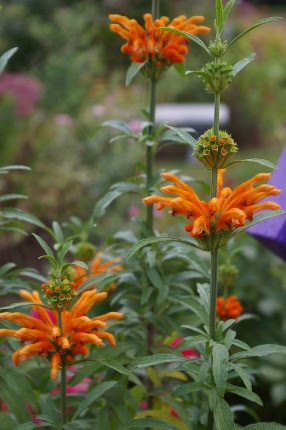 Leonotis is here- not blooming of course, but if you want to grow it in your garden, grab it now! We have the best selection of unusual annuals and tropicals we have ever carried. Many types are only here for a short while- when they are gone, they’re gone. We have the amazing orange Leonotis (Lion’s Mane) that everyone admires in late summer. We have fragrant Nicotianas and Four O’Clocks, cool flowers that open at 4 in the afternoon and emit a lovely scent. We have annuals for cutting, annuals for hummingbirds and butterflies, annuals for pollinators. We have pretty pots already planted up and all kinds of cool containers that we can fill for you at our potting station. We LOVE to help you select plants and then pot them up for you. Leave the mess behind! We have climbing vines like morning glories, purple hyacinth beans, moonflowers, and passion flowers. 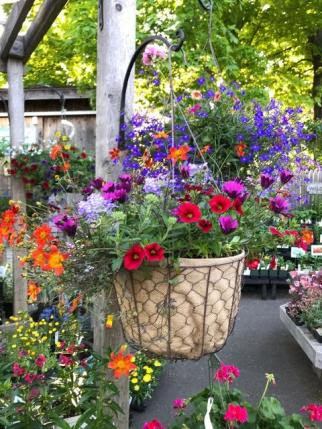 And of course we have gorgeous hanging baskets of all sorts. And then there are the perennials. So many perennials are coming into bloom this week! Columbines and Baptisias top my list of late May favorites. Salvias, Veronicas, Dianthus, Nepetas… the list goes on and on. Roses? 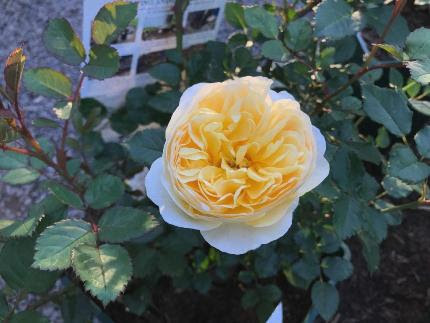 David Austin roses are perfuming the air this week, along with a carefully curated selection of easy-care shrub roses. Clematis? Yes, that’s starting to flower too! There really isn’t a better week to visit. 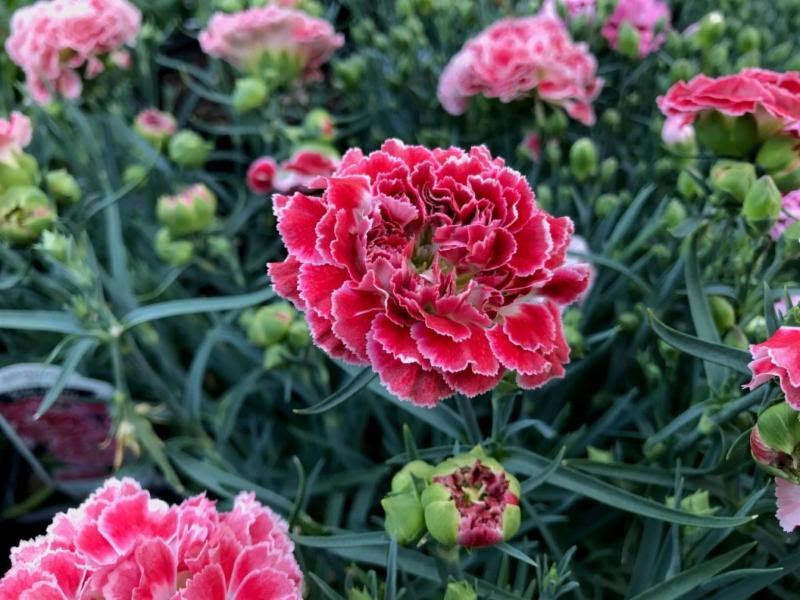 Fragrant Dianthus are in full bloom this week. Great gardens need support and we are proud to stock wonderful, sturdy peony hoops (also ideal for dahlias), super-strong tomato cages that fold up flat, and, new this week, beautiful cucumber trellises and obelisks for climbing vines. Great gardens need organic feeding, and we carry all of the granular and liquid organic fertilizers used by our crews in our client’s gardens including Azomite, a mineral powder that Cricket Hill peony farm recommends for all peonies. Great gardens need protection- we have row covers and hoops and we can show you how easy it is to use them. We also have organic pest control products for lily leaf beetles, slugs, the rose sawfly, gypsy moths, and anything else that’s bugging you right now. I spotted my first asparagus beetle on Monday– that’s a sign that scouting for many pests begins in earnest. 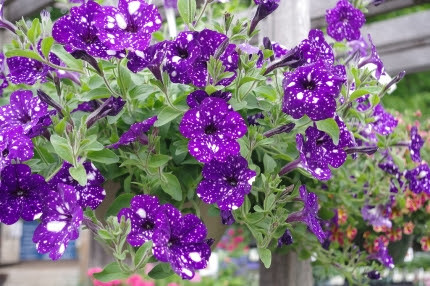 In the articles below, you will read all about my staff’s new found appreciation for old fashioned flowers and a few interesting plants with a purpose that you really should incorporate into your landscape. We have raised and released many Eastern black swallowtail butterflies this month. Chrysalises were gathered last fall and stored over the winter in Diane’s garage. 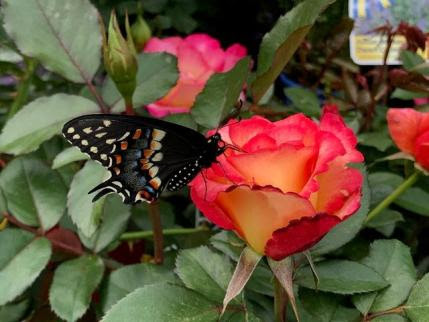 Above is a swallowtail resting on one of our roses before taking off to a nearby nectar flower. This Thursday afternoon at 5 pm, tune into Facebook Live. I will be discussing roses. I will explain how the different types of roses grow and how to care for them. Many are fragrant-I wish you could smell them through the computer screen! Facebook archives our live videos so you can watch the video whenever you’re ready by viewing it on our Facebook page. This Saturday I am teaching the workshop Food and Flowers Belong Together. You do need to preregister and the fee of $10 includes your choice of two plants- one edible, one flowering. Learn how to successfully combine plants to increase pollination to assure a generous harvest. Learn which flowers are vital for the beneficial insects that bring balance to your yard. Sign up today with a friend- it’s a great way to get inspired for the upcoming Memorial Day planting weekend. So let’s all press the magic restart button and enjoy the week and holiday weekend ahead. We hope for better weather, plenty of sunshine, and perfect spring days so we can all get out in the garden and play. We look forward to seeing you soon. 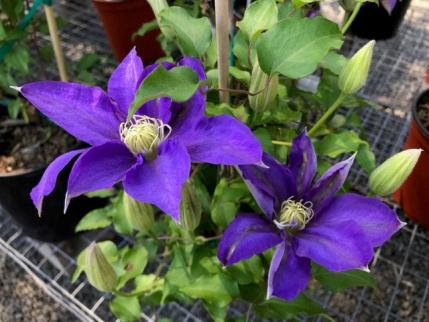 The Clematis are starting to flower this week!